Okay, that's enough. That is a site which will presumably take the next step in petitioning Warner Bros. to release Zack Snyder's cut of Justice League. I don't know what we're going to get when that countdown clock hits zero, but if it's an explosion it'll be fitting for a cause that is likely to go up in flames. We've seen online petitions for an all-Snyder version of Justice League, and even some members of the production requesting the same thing. But there isn't likely to be an assembled, complete movie of just Snyder's material. Remember, he left early and was replaced by Joss Whedon, who then went on to do extensive reshoots. 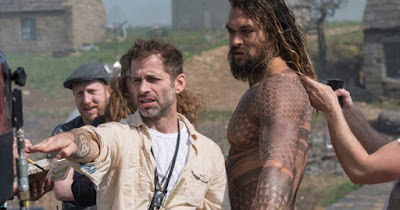 The Snyder footage wasn't completed when he left. Some of it, maybe, but certainly not enough to make a complete, coherent movie. And one final point on this. Justice League is about to wrap up its theatrical run as the lowest-grossing DCEU movie. Yep, less than Man of Steel's $668M back in 2013. Think about that. You think Warner Bros. wants to go back in and dump a bunch of money back into Justice League just to...what, put out a different version on the Bluray release? Send it back into theaters where it can be ignored/criticized again? Something tells me it isn't high on their to-do list. Best they can do is focus on the home release, but even the cover art seems to confirm there won't be an additional cut of the movie. It would be featured prominently on the cover, wouldn't it?